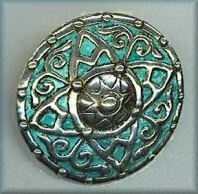 Silver and enamel shield brooch by Alexander Ritchie. 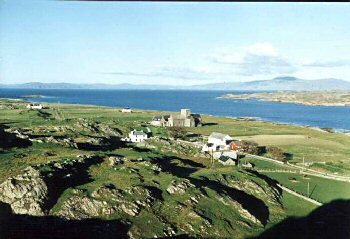 Classic high-relief markings of AR and IONA. No hallmark. Early 1920s piece in a very unusual colour. 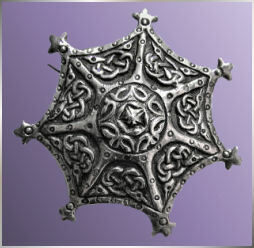 Unusual silver brooch known locally as the 'starfish' brooch - believed to have been inspired by a starfish seen on one of Iona's beaches. Ornate knotwork beasts in small panels. 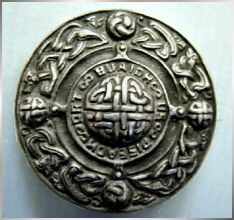 Reverse has AR IONA and ICA with hallmarks for Birmingham 1938. Very rare large and heavy silver shield brooch, with double hallmarks of AR within the legendary 'spectacle' mark, and Glasgow hallmarks for 1925. Also in the centre there is a further AR and IONA, together with a registered number 644440. The front has a Scots Gaelic inscription surrounding the central knotwork boss, which translates as 'May Success and Prosperity Be Yours'. Very few of these brooches were made. It has a heavy, dark patination, and looks as though it hasn't been cleaned (or perhaps even worn) for several decades. The outer circle comprises eight knotwork beasts interspersed with four bosses, two of which are of spiral design and two of knotwork. 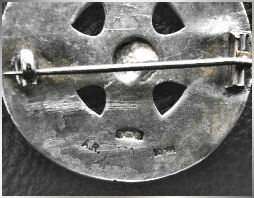 Diameter 4.5cms. This has to be one of the finest shield brooches that Ritchie made, and the only one I have come across in the years of building this website. 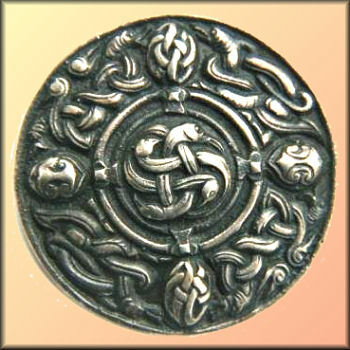 Alexander Ritchie circular silver brooch, diameter approx 1", ornate Celtic swirl pattern. 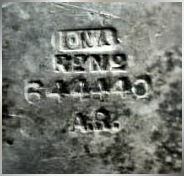 Reverse markings just of AR and IONA. Early unhallmarked period, c.1915-1920. 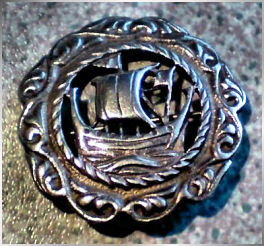 Attractive Alexander Ritchie silver shield brooch, dameter 4.5cms. 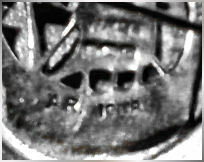 Reverse markings of AR IONA and AR within 'spectacle mark' alongside Glasgow hallmark for 1925. 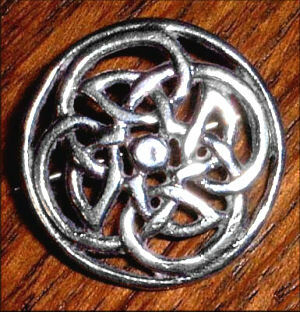 Foliate and knotwork designs taken from medieval Iona stone carvings. 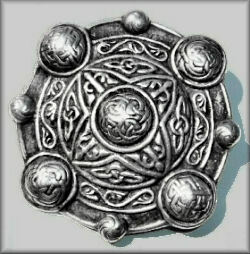 Attactive silver brooch by Alexander Ritchie, the design being a central longship surrounded by foliate patterning. 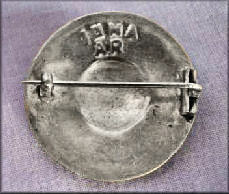 Reverse has marks AR IONA and ICA with Birmingham hallmark for 1936. 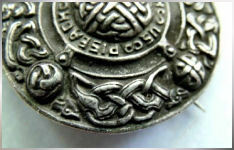 Attractive shield brooch by Alexander Ritchie. 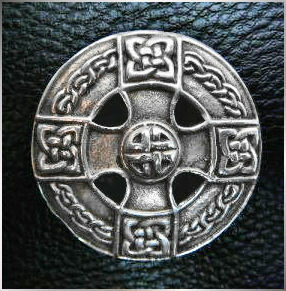 Pierced Celtic cross design with knotwork border, panels, and central boss. 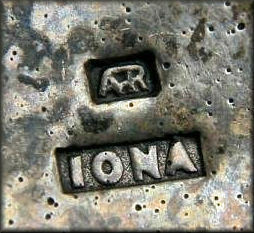 Reverse marks of AR IONA ICA and Birmingham hallmark date for 1936. Large and heavy solid silver plaid brooch by Alexander Ritchie from his early unhallmarked period, c.1910-1920. Diameter just over 4.5cms. Elaborate central boss with four interlaced birds heads, and outer rim with four knotwork beasts between four smaller decorated bosses. A fine piece. 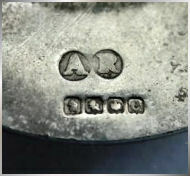 Reverse is just marked IONA and conjoined letters AR.